Update: On Dec. 4, U.S. Magistrate Judge Peggy Leen allowed for the pretrial release of four more co-defendants: Mel Bundy, Dave Bundy, Joe O’Shaughnessy and Jason Woods. O’Shaughnessy’s release is dependent on agreement from a federal judge in Oregon in regards to release stipulations around the 2016 Malheur National Wildlife Refuge occupation. The four men are expected to stand trial for their parts in the 2014 Bunkerville standoff, following the end of the current Nevada trial. U.S. District Court of Nevada Judge Gloria Navarro announced the decision late Wednesday following a closed-door court session. Her decision allows for the release of Cliven, son Ammon, and Ryan Payne, a self-proclaimed militia member of Montana, for the duration of their trial. Ryan Bundy, Cliven’s second son on trial, has already been released, to an approved residence in Las Vegas. The four men face 16 charges for leading an armed standoff in 2014 with federal agents who were attempting to gather Bundy cattle that had been illegally grazing on public land. The judge allowed for Ammon and Cliven to be released under “lock down” at approved Las Vegas residences. In announcing her decision, Navarro said she had “reweighed” the evidence but remained “a little reluctant” to release the men. The release includes a list of conditions, including prohibiting access to firearms and contact with government witnesses. Payne will be released pending approval from Oregon District Judge Anna Brown, who presided over a case against him there related to the armed takeover of the Malheur National Wildlife Refuge in 2016. Brown had allowed Payne to come to Nevada for the Bunkerville standoff trial, but he still awaits release and sentencing for the Malheur case. 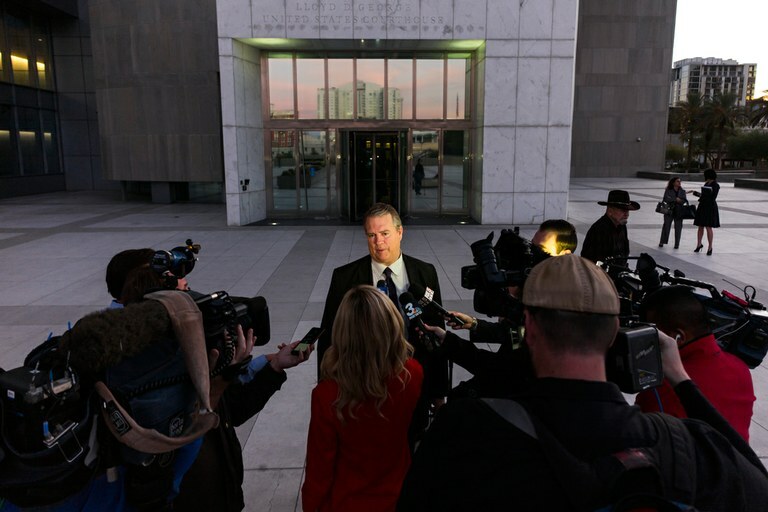 The court’s decision to release the Nevada defendants occurred in a sealed hearing on Wednesday, the details of which attorneys have declined to comment on. The trial is expected to continue over the next several months. The following day, Whipple said he had new information: that a BLM officer had asked the Bundy family member “what will it take” to get him to relay information to Cliven about the upcoming cattle impoundment. This statement could be interpreted as a bribe, Whipple said. Whipple later told High Country News he intends to bring a witness in the case to testify to this alleged bribe. Also at issue in the trial are conflicting arguments about how much of a physical threat Cliven and his sons truly posed to federal employees. “We didn’t know what type of threat was coming our way,” Shilaikis, the BLM employee, told the court on Tuesday. In a recording of a phone call weeks before the standoff between two BLM law enforcement officers and Ryan Bundy, who is defending himself, played in court multiple times this week, the Bundy son said: “We are going to stop your (cattle) gather…I won’t tell you what we will do and what we won’t do. We will do whatever it takes.” Bundy also said he would have “hundreds” of supporters to help stop the impoundment. The prosecution attempted to use this recording to lay out how the BLM had tried repeatedly to find a resolution and communicate with the family about the upcoming impoundment. The defense used the opportunity to call into question government competence and trustworthiness. Through questioning Shilaikis, the defense team challenged the legality of recording a phone call in the first place. “There’s nothing improper with the call,” prosecutor Myhre contested. Ryan Bundy then indicated that Shilaikis’ partner, officer Michael Johnson, lied to him and denied recording the call. “Is that standard procedure for BLM to be untruthful in speaking with people?” Ryan Bundy asked Shilaikis. The defense’s line of questioning appeared to affect the jury. In written questions for the witness on Tuesday, rather than show an interest in the government’s case, they queried mostly about what the defense had poked at in cross-examination: BLM procedure and the legality of recording phone calls. Also coming into relief this week are differences between the case of the Bundys themselves and their co-defendant, Payne, who organized militia members to travel to Nevada to help the Bundys stave off the feds. Payne’s co-counsel, Ryan Norwood, requested that the phone call between BLM officers and Ryan Bundy not be played in court in its entirety because it could cast a negative light on Payne. Ryan Bundy’s statement that there were “hundreds” of supporters waiting to help, was an issue for Norwood, who worried the prosecution would use it to demonstrate “some kind of preexisting conspiracy.” Bundy supporters included ranchers, not just a massive throng of militia, Norwood wanted to make clear. What appear to be differences in strategy between Payne and the Bundys echoes a larger reality of the Bunkerville standoff. The 2014 event marked the coming together of traditional Sagebrush Rebels, who have been at odds with federal land agencies for decades, and a new wave of “patriot” groups that proliferated following the election of President Barack Obama. In the months and years following the standoff, other natural resource disputes with the federal government continued to bring together Sagebrush Rebels and militia. The current trial puts these relationships on display as Payne, a representative of the militia movement, makes his case alongside the Bundys, icons of the Sagebrush Rebellion. Tay Wiles is an associate editor with High Country News.